Nestled amidst some of the most popular attractions of Bangkok like the Ban Khlong Bang Pa Kok, Ban Khlong Bang Pa Kaeo and Ban Lao. This is one of the most picturesque monasteries you will come across in Bangkok. The grounds of the monastery hold royal significance owing to two facts. Firstly, it was here that Prince Uthumphorn attained his monkhood. Secondly, King Rama VI visited the monasteries to spend his summers. To witness the monastery in all its glory, make sure you visit when there is ample delight. Evenings can be a great time to come here, ascertaining mesmeric bliss! Local travel guides will amplify your fun in the city as they walk you around the major attractions. 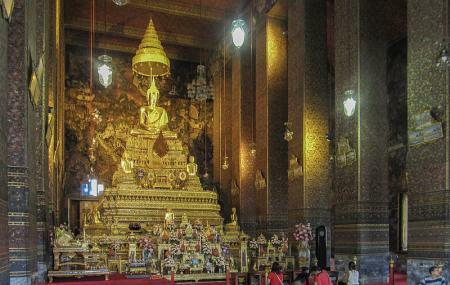 You can book Bangkok tours for such assistance. You can enjoy a comfortable stay in the city by booking the best hotels in Bangkok like Ibis Bangkok Riverside, Kokotel Bangkok Surawong, Holiday Inn Express Bangkok Sathorn and Marvin Suites. How popular is Wat Pho Thong? People normally club together Wat Chakrawatrachawat Woramahawihan and Samphran Elephant Ground And Zoo while planning their visit to Wat Pho Thong. I really really love this place!!! Amazing fortune teller by abbot. This monk is believed as being real Garuda who reborn to be human. Also have holy talisman & amulet.